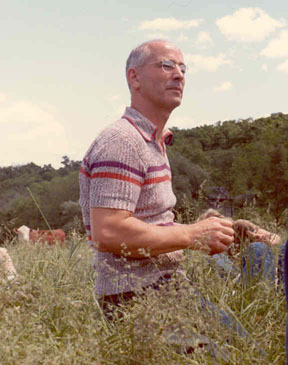 Joseph Thomas Langland, a nationally known Norwegian-American poet, was born in Spring Grove, Minnesota on February 16, 1917. Langland’s parents, Charles M. Langland and Clara Elizabeth (Hille), raised him and his eight siblings in northeastern Iowa on the family’s general farm which had been homesteaded by his grandfather in 1877. Langland attended rural schools, Santa Ana College of California and the University of Iowa. In 1940, Langland was awarded his BA from the University of Iowa; a year later the same institute presented him with his MA. Joseph Langland married Judith Gail Wood on June 26, 1943. The couple had three children: Joseph Thomas Jr., 1946; Elizabeth, 1948; and Paul, 1951. Joseph Langland served in the U.S. Infantry for four years from 1942-1946. Two of these years were spent in Europe during WWII. He was near the Elbe River when Pres. Franklin D. Roosevelt’s death was announced, and in Weimar on V.E. Day. After the combat had ended Langland spent several months with the Military Government in Bavaria. Langland was with a detail who liberated the Concentration Camp at Buchenwald. It was during the war years that Langland published his first collections of poems; For Harold (1945) for his younger brother who was killed in action in the Philippines. While in the Army, Langland worked his way up from the rank of Private to Captain. Joseph Langland spent 1941-1942 as an instructor of English at Dana College, Nebraska. From 1946-1948 he was a part-time instructor at the University of Iowa. Working as an assistant professor and later associate professor, Langland spent 1948-1959 at the University of Wyoming. 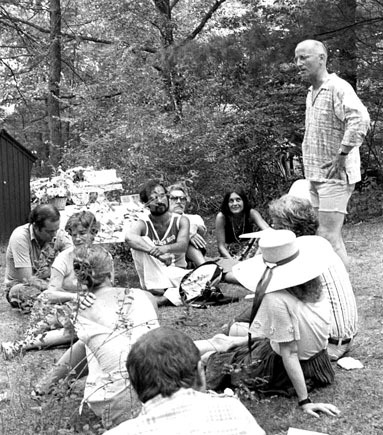 He then moved to the University of Massachusetts, Amherst, where he served as a faculty member from 1959-1979, Professor of English, 1964-1979 and Professor Emeritus 1979-present. While at U. Mass. Langland also served as the Director of the Masters of Fine Arts program in writing from 1964-1970, 1978-1979. Besides his normal teaching duties Langland traveled as a guest lecturer to the University of British Columbia, University of Washington, and San Francisco State University. He received an honorary doctorate from Luther College in 1974. Joseph Langland was a distinguished, published poet and author. Published works include: Poems For Harold (1945), The Green Town (1956), The Wheel of Summer (1963) 2 nd edition (1966), An Interview and Fourteen Poems (1973), The Sacrifice Poems (1975), Any Body’s Song (National Poetry Series) (1980), A Dream of Love (A poem with etchings) (1986), Twelve Preludes and Postludes (1988), Selected Poems (1991) 2 nd edition (1992). Langland co-edited Poet’s Choice with Paul Engel(1962), The Short Story (1956); and co-translated Poetry From the Russian Underground (1973). Joseph Langland was awarded the 1953-1954 Ford Fellowship in Humanities, Harvard-Columbia Universities; the Amy Lowell Poetry Fellowship in Poetry 1966-1967; the Melville Cane Prize-Poetry, Poetry Society of America 1964; and was named a Living Art Treasure in Literature for the New England Arts Biennial 1985. He died April 9, 2007 at his home in New Rochelle, NY at the age of 90.